Portrait of Johnson during the 1970s era. Cave Johnson is the founder of Aperture Science, which evolved from its precursor, Aperture Fixtures and later Aperture Science Innovators. Cave Johnson first appeared by initials in one of the Rattmann's dens during Portal, and was fleshed out and provided with additional details during the Portal ARG. In Portal 2, Cave Johnson became a prominent character through a variety of automated audio recordings from the late 1940s to as late as sometime in the 1980s. His current status and whereabouts are unknown, but he is presumed dead due to his exposure to the toxic by-products created as a result of refining moon rocks. Cave Johnson is voiced by American actor J. K. Simmons. In 1953, Cave Johnson created Aperture Fixtures, a shower curtain manufacturer. The precursor to Aperture Science, he selected the name because it 'makes the curtains sound more hygienic'. He became a billionaire after winning contracts to manufacture shower curtains for all branches of the U.S. Military except the Navy. During his career in science, he called upon the wealthy and powerful to join his cause for the future of science. He also employed top scientists and other staff who were dedicated to the field, such as Caroline, and those lacking common sense for the dangers inherent in scientific experimentation. Most of his ideas were wild and, more often than not, lethal. Some experiments involved replacing the test subject's blood with gasoline, or injecting test subjects with mantis DNA, while others exposed a test subject to jet engines in order to lower the amount of water in the human body. The latter experiment was conducted after Cave Johnson concluded that the average amount of water in the human body 'seemed excessive'. Most of his crackpot ideas turned out to be massive failures, leaving only a few that seemed to be remotely useful, such as the gels that appear during the later stages of the game. At the time of its creation, Aperture Science Innovations had developed the Aperture Science Portable Quantum Tunneling Device, a prototype to the modern Handheld Portal Device Chell wields. As such, it seems that Aperture had already started to perfect portal technology, but was not ready to release it to the world, under the belief that much more could be done than just create portals. Of course, the technology was also impractical and bulky, and was delayed by Cave's wild innovations. During the 1970s, Aperture Science had become known as just 'Aperture', and the rise of Black Mesa and its success in bidding for contracts pushed Cave's temper to the limit. It is also implied that Black Mesa stole designs from Aperture and began to produce them commercially before Aperture could do so because Johnson refused to release the devices until they met his excentric standard of perfection. It was around this time that Caroline became a bigger part of Cave's life as a secretary, and Cave became more desperate in his struggle to continue his work by offering incentives to potential test subjects, although only rarely were test subjects able to collect their reward due to the hazards involved. At some point during the 1980s, Cave Johnson had renamed the company to Aperture Laboratories, a name that would be known far into the future. However, the number of willing test subjects had dwindled over the years, and out of desperation, employees and random strangers were pulled off the streets in order to be a part of the testing. The technology had advanced greatly, and robots had started to replace human employees. These employees then become unfortunate victims in Cave's quest for the future of science. During his final days, Cave stated that he had tried to purchase a number of "moon rocks". However, his last few recordings indicated that these acquired "moon rocks" were toxic, and resulted in a fatal illness (possibly silicosis, a real effect from breathing dust from crushed lunar rock). He explained that he contracted the illness when, in one of his wild ideas, he was grinding moon rocks together in the name of science in order to form a new type of substance called the 'Conversion Gel', most likely named due to its ability to serve as a portal conductor and allow portals to be placed on any surface. As the symptoms of his terminal illness became more severe however, he decided to re-purpose the 'conversion gel' to create new portals that would hopefully leech the poison out of his system. As his illness progressed, Cave's emotional state, already precarious due to the success of his rival Black Mesa, began to deteriorate. It was at this point that Cave mentioned the aphorism "When life gives you lemons, make lemonade". As his condition became more debilitating, Cave's comments became increasingly emphatic, resulting in advice to never give up, "get mad," and "make life take the lemons back!". Despite his attempts to stave off fate, all attempts to cure his affliction failed, and with little hope of a cure, he instructed his engineers to start research on artificial intelligence (AI) and brain mapping in the hope that his brain could be downloaded into a computer. Cave also stated that they "should've been doing this 30 years ago". Fearing that he would die before the release of the technology, he left instructions that his secretary Caroline should take charge of Aperture Science, and that she should be downloaded into the computer intended for him. He stated that he knows that "she will decline at first or feel she can't do it", which he followed up with "force her to do it if you have to". It is presumed that Caroline was selected due to her devotion to scientific progress, a trait admired by Cave, and also due to their close relationship. It is unknown what became of Cave himself, but it is presumed that he fell victim to his illness and, ultimately, to science. During Portal when Chell makes her first escape, there are several "Rattmann Dens" that are scattered throughout the facility. In one of them, there are several pictures of a suited man with a small picture of a Companion Cube over his face, along with the words "Our Founder" found in one of the photos. Below the mad scribblings from Rattmann is what appears to be a login name and password labeled "cjohnson", with the password "tier3", alluding to Cave Johnson himself. It would later be discovered that this could be used on Aperture Science's own website, giving more insight into the grim world of Aperture Science. Additional details about Portal 2 background were provided by the first Portal 2 ARG in March 2010. 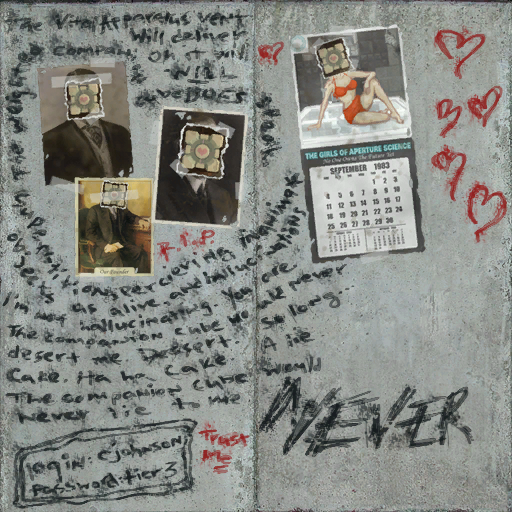 On those notes, Cave Johnson's life, as well as Aperture history, look much different than in Portal, foreseeing the ret-conned Aperture history showcased in Portal 2: most notably, some of the ARG text findings are written into the form of Cave Johnson's post-mortem memos, implying that Johnson's consciousness was uploaded into an AI, much like Caroline's in the final game. During the events of the Perpetual Testing Initiative, Cave Johnson and his numerous duplicates resume(s) his place as the head of Aperture Science and guides the player character, Bendy, through the multiverse. These events take place in a parallel universe(s) in which Cave did not die of moon rock poisoning. 1950s portrait of Cave Johnson, a nod to a similar portrait of Walt Disney. Cave Johnson with his secretary, Caroline. 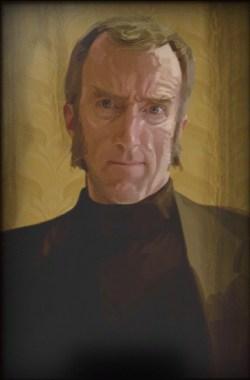 1980s portrait of a dying Cave Johnson. Concept art from the leaked 2008 casting call. During early stage of development, Cave Johnson was planned to be the player's sidekick, taking the form of an AI. As the story progressed, he would lose his touch with humanity and eventually try to become a full robot, leading to a robot uprising. Cave would confront the player for their "committed crimes against their brothers-in-arms" and become the game's main antagonist. Cave's original role of sidekick to antagonist was recycled in the final game by Wheatley. In one of the alternate universes introduced in the Perpetual Testing Initiative DLC, Bendy encounters a version of Cave Johnson who has been immortalized inside a computer, nicknamed CaveDOS. The 1950s portrait of Cave Johnson bears strong resemblance to a photo of Walt Disney. Valve Lead Animator Bill Fletcher was the inspiration for the appearance of Cave Johnson. ↑ BBS resource list @ Combine OverWiki. Retrieved 2011-26-05. This page was last modified on 12 July 2013, at 14:45.